As the war between big-lick traditionalists and flat-shod advocates rages on, Candace Wade offers a candid account of life in the heart of Tennessee Walking Horse country. The map of pain posted on the All American Walking Horse Alliance (AAWHA) shows a big glop of violations over Tennessee. The state is very resistant to legislation protecting horses from what is considered abuse in other states. I moved to Middle Tennessee in 1999. Eager to explore my bucolic new home, Sunday drives included the lush pastures of Shelbyville, TN. 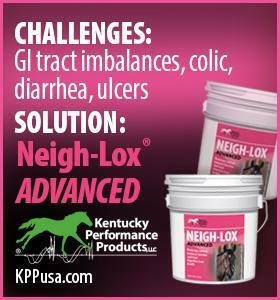 Shelbyville is “big lick” (performance) Tennessee Walking Horse Mecca. I puzzled why I never saw horses grazing the fields. I discovered the show horses don’t gambol around like horses usually do. A performance horse is detained in a stall, bound by elevator (padded) shoes, chains and other training equipment. Imagine Kim Kardashian trying to sprint across Central Park in her platform stilettos. Welcome to the tenacious Tennessee “padded or die” mentality. Is This the Same Horse? I entrust my life to Tennessee Walking Horses on trail rides through the rugged terrain at Big South Fork National Recreation Area of Jamestown, TN. They are willing, patient, calm and surefooted. Their Samba gait is well suited for beginners, those with back problems and the bones of this “mature” woman rider. Enter a friend who was a minor “big licker.” He took me to my first (and only) visit to the Tennessee Walking Horse Celebration at Shelbyville. I was struck by the jacked-up, wild-eyed, snorting, flaming red nostriled beasts all sweaty and foaming between the legs before they even entered the arena. Their sides heaved as they goose-stepped out after a quick spin around the ring. How could this be the same breed that carried me on five hour rides up craggy trails, navigated slippery creek beds and fast-walked for long stretches on loamy paths without breaking a sweat? Then came the storm instigated by reports of soring and other related pain inflicted on the breed. I awakened to the concerns of the anti-soring supporters and the rationalizations by the “big lick” supporters. Author’s husband ready for trail ride on a TN Walker. Photo courtesy of Candace Wade. April 11, 2013 – Rep. Ed Whitfield (R-KY) introduced H.R.1518, the Federal Prevent All Soring Tactics 2013 (PAST Act) to the 113th U.S. Congress. 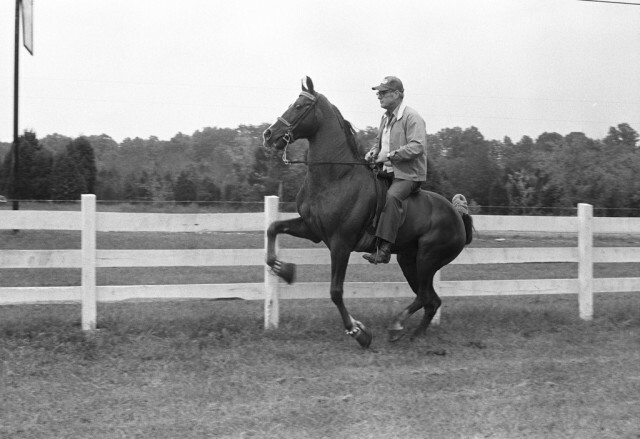 The bill aimed to improve the Horse Protection Act of 1970. It cleared the Senate, but stalled in the House. Senators Kelly Ayotte (R-NH) and Mark Warner (D-V) introduced PAST Act 2015 (S.1121) in April 2015. Two veterinarians, Congressmen Ted Yoho (R-FL) and Kurt Schrader (D-OR) led the House version (HB HR3268) into the arena in July. Senate and House Republicans and Democrats have joined once more to sponsor the PAST Act 2015. And Tennessee? Most of the Republican members of the House of Representatives from Tennessee are trotting behind Rep. Marsha Blackburn’s (R-TN) with her H.R. 4098, a gelded alternative to the PAST Act 2015. Senators Lamar Alexander (R-TN) and Bob Corker (R-TN) have joined with Senators Mitch McConnell (R-KY) and Rand Paul (R-KY) in the companion version for the Senate. FYI, while PAST Act 2013 languished in Committee, Rep. Blackburn supped at a $100-a-head reception at The Celebration in Shelbyville held in her honor. The Performance Show Horse Association has donated $70,000 to Rep. Blackburn and endorses her current bill. The mega powerful TN Farm Bureau (who also supports Blackburn) has stood against horse protection acts since I moved to TN. The PAST Act 2015 is the only bill that would end the full range of soring practices of Tennessee Walking Horses, Spotted Saddle Horses, and Racking Horses and return the breeds to their natural gait. It would end the sham of self policing that has proven to be ineffectual. Ending the soring practices and devices is supported by more than 280 horse industry professionals, veterinary advocates, equine associations and organizations. Over 40 Senators support PAST Act 2015 so far. “Self-Policing” — Does It Work? The scripted mantras “only a few bad apples,” “government over-reach” and “defend our freedom and rights” coupled with fear invoking fallacies that the PAST Act “eliminates the horse” and “would destroy the Walking Horse industry” misdirects attention from the on-going abuses within the “big lick” ranks. Contrary to “big lickers'” contention that “we’ve come a long way,” continued discoveries of abuse indicate that we’ve not come far enough. In April 2015, the Walking Horse farm owned by “big licker” Jeffery Alan Mitchell was raided by Giles County (Pulaski, TN) sheriff’s deputies and animal welfare officers. Fifty-four Tennessee Walking Horses (housed on four acres) were confiscated, all severely malnourished to emaciated. Some couldn’t walk. Gen’s Ice Glimmer on Craigslist. Source: billygoboy.com. Methods of soring include grinding or trimming the hoof and/or sole to expose sensitive tissues and/or removal of the support structures of the hoof wall; inserting a hard object between the pad and the sole to place pressure on this sensitive area; over-tightening metal hoof bands to cause pressure; application of corrosive chemicals and weighted chains. A lunch with a non-political, non-advocacy equine rescue group left me haunted by stories of how trainers game the inspectors. The stories were as disturbing as the actual soring. Methods include numbing agents to mask pain during inspection. Training, or stewarding, during mock inspections teach the horse that a flinch will cause greater pain. Pain is inflicted in a location other than the hoof as a distraction device. A burning cigarette pressed to the inside of the nostril; beating if the horse flinches; electric shocks; a barbed wire harness twisted over a horse’s head and ears have been used to teach the horse not to move during inspections. Built up pads, called “stacks”, held on by a band over the top of the hoof, are used in performance divisions. Source: USDA/CC. X-rays can show the nails within the pads, used for additional weight and possibly pressure (known as “pressure soring”). Source: USDA/CC. The Performance Show Horse Association sponsored a billboard — “HSUS (Humane Society of the United States) Stop Trashing Our Tradition” — that blazed above the bleachers at this year’s Celebration. The credo “preserve the Walking Horse tradition,” is a romantic appeal to Tennessee pride. “Big lick” has been fabricated into acceptable animal cruelty by labeling it tradition. It isn’t a tradition. I can’t find photos of “big lick” champions until around the 1970s. It’s as manufactured as Ms. Kardashian’s profile. “Big lick” tactics are a quick fix to manufacture the exaggerated gait. The plantation or flat shod is the tradition. Preservation of heritage is legitimate ad copy at the new Harlinsdale Equestrian Park in Franklin, TN. This city park is on the historic farm where World Grand Champion (1945, ’46) Midnight Sun (hailed by Tennesseans as “The Horse of the Century”) lived from 1940-1965. He was “plantation” or flat shod. In the heart of Walking Horse Tennessee, Midnight Sun could lead the Tennessee performance Walking Horse industry out of cruelty for cash — pain for vanity. I’d like my state to return their Walking Horse to its traditional beauty. I’d be proud to see that big glop disappear over Tennessee. The Park at Historic Harlinsdale in Franklin, TN, home of legendary Midnight Sun. Photo courtesy of Candace Wade. Candace Wade wrote the book “Horse Sluts – The Saga of Two Women on the Trail of Their Yeehaw.” She has contributed to Horse Nation, Mature Lifestyles and The Tennessean. Candace writes political diatribe, wrote “Hillary’s View” pet column and four unpublished film scripts. She learned to ride at age 46. Still rides at 59+. “Horse Sluts” is available on Amazon, Taborton Equine Books, Northshire Bookstore and True West Campground and Mercantile. Meet Candace at the Equus Film Festival NYC in November, where she will be sitting in on a literature panel. 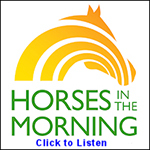 Keep it tuned to Horse Nation for an upcoming book review!